This morning we left Melkevoll Bretun Camp site and headed back along the same road (route 724) we'd used to get there 4 days ago, and as we went we were keeping our fingers crossed that we wouldn't meet to much traffic coming the other way, because in places the road is very narrow indeed! Ten Buses, Five Trains and 15 kilometres later we made it to the town of Olden and once there we realised that although the road had been congested it could have been much worse - there were 2 huge cruise ships in port and they were still disgorging hundreds of people who I'm sure would all have been on their way along Route 724 to see the Brikdals Glacier! We later learnt that each ship has about 3,000 guests so if we'd met them all that would have been an awful lot of buses!!! From Olden we left Route 724 behind and continued along Route 60 and this took us through the town of Leon where they have recently installed a gondola cable car that takes 5 minutes to whisk you 1011 metres up a very steep mountain side to the top of Mt Hoven. But the price is equally steep and can be calculated as either £10 a minute or £50 for the whole trip, and that's each 😮! So we gave it a miss because our budget has already been stretched quite enough while we've been here in Norway! Next came Stryn where we stopped to do a quick shop in Rema 1000, and it was here that I brought a very strange item indeed!! I'd ask you to guess but I don't think you'd get it in a million years! When I picked it up I thought it was just ordinary cheese but when we tasted it 😋😛😩 - it's a bit like goat's cheese flavoured with Caramac chocolate!! Our journey continued with us still retracing out tracks back up the very beautiful but very twisting Route 15, and once we gained the summit we stopped for lunch in a Resteplass where we'd previously spent the night (5 nights ago), before carrying on further along the same road but now rolling over new territory. 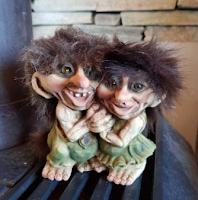 And as we passed through this mountainous region of Norway I was keeping a very sharp eye out in case I could catch a glimpse of a creature that has fascinated me for a very long time, and that is the TROLLS! Trolls are usually big old ugly creatures with four fingers on each hand and 4 toes on each foot! They have shaggy hair, tails similar to a cow, and their most striking feature is their long noses which Troll wives often use to stir their cooking pots. 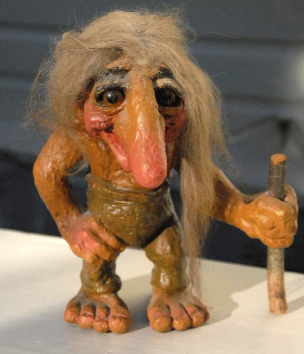 However, it was very doubtful if my quest would be successful today because it's a well known fact that if Trolls get caught out in the sunshine they turn to stone! Therefore, I'm fairly sure I'll have to continue making do with the selection that is usually available in many of the shops - and when John's not watching I'll be nipping off to add to my 'ugly' ornament collection! A view from somewhere along the road we travelled! Eventually Route 15 gave way to Tourist Route 55 and after that we didn't go to much further before we settled in a little Resteplass in yet another high sided valley called Dumdalen - another free and peaceful place for us to spend the night! When we left last night's parking spot we continued to wind our way up the very steep barren slopes of Route 55 and here we found that very frequent stops were necessary to accommodate the oncoming traffic. Snow poles also marked the path of the road and along the sides there were numerous cairns, masses of cascading waterfalls and lots of lakes, so rounding nearly every corner brought a new vista for us to feast our eyes upon! We were also sharing the road with a fair few sheep who were totally oblivious to the oncoming traffic - so understandably - our progress was fairly slow. Once again this whole area had been shaped by the effects of glaciation in the last ice age, and in many places snow still covered the mountain sides. Additionally, for many miles it almost felt as if we were riding a roller coaster and my very skilled driver certainly needed every single trick he'd got in his arsenal to keep us safe as T4rdis2 clung right on the edge of some very precipitous drops while coaches, caravans and all manner of other motorised carriages squeezed by. Our problems were also added too as we dropped down steep gradients on the other side of the pass by the rough wash-board surface of the road, soft verges and occasional awkward cambers on the many hair-pin bends. Once out of the mountains our next target was the town of Sognadal but the driving challenges continued as we partially circumnavigated Sogna Fjord. Here the road was single track with passing places and unfortunately our wing mirror got clipped again by a moron who didn't like his right hand side of the road - but this time it was only low impact so no harm was done - other than to my ears by John's blue comments! From Sognadal we nipped along the much better Sognefjordvegan to the town of Hella where we just missed our ferry over to Vangsnes, but in a way that was a good thing because while we waited for the next one we treated ourselves to a delicious chocolate and vanilla ice cream - I think it was the first we've had on this tour so we both really enjoyed our £4 each worth😋😋! The ferry chucked us out onto Route 13 and initially we then followed the opposite side of the fjord, but eventually we left that behind and chugged up another high pass and down the other side to reach the E16, and at that point we started looking for somewhere to park for the night, especially as the rain was coming down in stair rods. As usual John had identified a couple of places that he thought would be OK , but the first said 'NO CAMPING' so we dutifully continued on to the next, but when that one had the same message we decided to ignore it especially after nearly seven and a half hours no the road! needed to lift the inside of the dustbin out to empty it! Well, it has to be said that a good chunk of today's journey has been underground - I lost count of how many tunnels we've been through but it's more than 20, and miles covered inside them must have exceeded 35!! 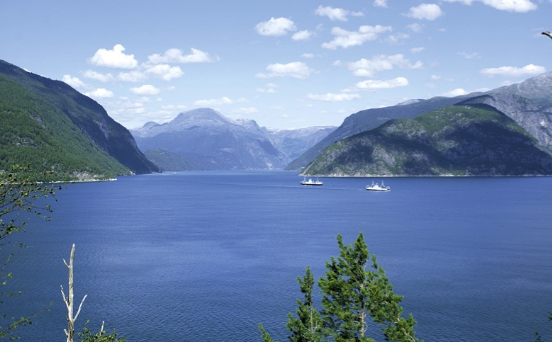 The first part of our journey was along the very mountainous E16 but we hadn't gone far before we turned onto Route 7 which would quickly lead us to the very famous Hardanger Fjord. However, after our long trek yesterday without many stops (mostly because of the rain), we were determined to work plenty in today - the first of them being at a pretty waterfall! Then our next stop was at another waterfall but this one was much more well known - The Steinsdalsfossen - where you can walk behind the fall and mostly not even get wet. Apparently it was created completely by accident at the end of the 17 century when the river flowed west of where the waterfall is today. In 1699 a farming area suffered great damage from flooding and this resulted in the old river course being closed off so that the water was forced over the cliff edge. The waterfall became a tourist attraction in the 19th century, and at that time people would travel to it in Carioles (small horse drawn carriages), but today they come in large numbers mostly by motorised transport, however we were quite lucky because the coaches only arrived as we were leaving! From there we passed through the village of Oystese and onto the Hardangerfjordvegen which runs alongside Hardanger Fjord and it's much like a shelf set on the steep mountainous valley sides, and it was also another road that we were a bit apprehensive about using after reading descriptions of it in other blogs. But we needn't have worried because although it narrowed in places it mostly had a dividing line down it's middle and it was 100% better than some of yesterday's 'tracks'. As we followed it we did have a couple of squeezes with lorries and coaches but it was very much a pleasure to drive along and it presented lots of varied vistas as we went. We continued along Route 7 until we came to the town of Granvin, and it was here that we turned onto Route 13 for out drive through the 7.5 kilometre Vallavik Tunnel that has a roundabout towards it's southern end. 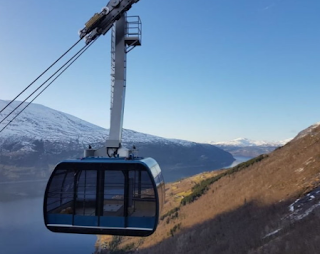 Apparently it was originally opened in 1985, but in 2013 a 600 metre long branch was added to connect the tunnel to the newly constructed Hardanger Suspension Bridge, and this was when the eerie spaceship like roundabout was installed. The tunnel exited us straight onto the 1,380 metre bridge and as we left that behind we plunged into another tunnel with another roundabout - they almost seemed surreal! 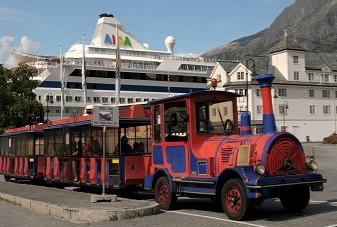 Now we were back on Route 7 and heading for our next destination which was the Voringsfossen fall but as we passed through the town of Eidfjord we spied two cruise ships parked up so we weren't particularly hopeful about being able to moor our big bus anywhere near the fall! But Hey Ho, we were going that way anyway we thought we'd still give it a go. However, to get there we had to get by another huge mountain - but this time we didn't go over it - we climbed through it via 4 more long tunnels that spiralled their way up towards our destination! And when we got there, although it was busy, we parked easily and then took the short rocky walk to the view points. 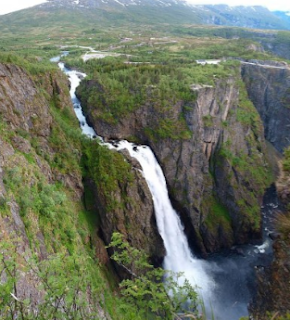 Once there we saw vast quantities of water plunge 182 metres from the Hardanger Plateau into the Mabodalen valley below. And after that today's journey was nearly done as we proceeded along another excellent road up onto the Hardanger Plateau where we planned to find a home for the night! 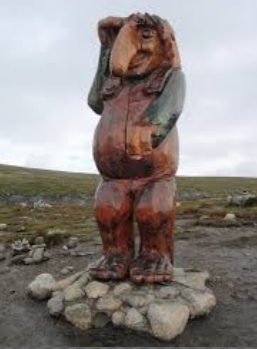 The road we were on - The Hardangervidda - crosses the biggest high mountain plateau in Northern Europe so we were quite excited about what might lie in wait for us up there, but I wasn't really expecting to find a Troll! The one on the right looks down on you from a lofty perch but I think he must have stayed out in the sun to long because he'd turned to stone, however I'm sure he waved at me as we shot by! Further along we had lovely views of Hardangerjokalen glacier and we eventually found tonight's home in a wild spot with a fantastic vista overlooking Halnefjorden! After a long night of heavy rain and a cold morning due to our altitude we were a bit reluctant to leave our warm cosy bed, but we eventually got going across more of the barren but beautiful plateau. The rain had left a dank misty almost eerie atmosphere, and in every direction that we looked water was cascading in either bubbling boiling streams or waterfalls. 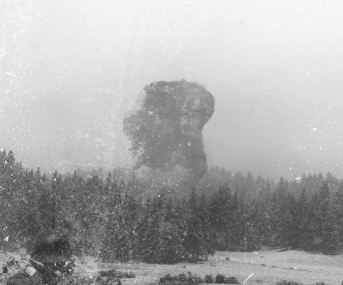 And really I suppose you'd almost think that on such a dreary morning there'd be nothing to see, but if anything I think the vistas were more magnificent because the shrouding clouds often shifted to reveal new views - and I think that even included another Troll!! He was probably keeping a watchful eye on us to ensure we were only visiting his territory and not settling in it. We came down of the plateau into the town of Geilo and it was here that we changed our direction from North East to South as we continued back up over another pass on Route 40, but here the rain returned with a vengeance and almost everything was completely obliterated from view! So in the end, today was mostly about getting from A to B in our quest to get to the parts of Norway that we still want to investigate, and I think the only really interesting thing that cropped up on our journey was the Stave Church at Uvdal which dates back to the end of the 12th century. After another couple of hours we arrived at today's destination which is another free spot near Notodden. However, it's not a place of any real interest, it's more just a resting place for us as we cross the country on our way to Pulpit Rock which is probably one of Norway's most famous sights - but the story for that will have to wait for next time.